As you have given yourself to us, O God, help us to give ourselves to one another in perfect charity. Thank you for men and women who work for the welfare of others. so that men may be believe you care; through Jesus Christ our Lord. Amen. The Presbyterian Church in Canada observes Presbyterian Sharing Sunday each September. Presbyterians Sharing is a denominational fund to support domestic and international ministries. The setting for Isaiah 52:7-12 is the impending end of the Babylonian Exile. Those about to depart for a ruined homeland in which they had never lived needed all the help they could get. St. Paul the Apostle was collecting funds for the church in Jerusalem. This offering was a gesture of goodwill from mostly Gentile churches in Jerusalem, per Galatians 2:1-10. One of the enduring lessons of Jesus feeding multitudes (as in the 5000 plus, reported in all four canonical Gospels) has been that no gift is too small in God’s hands. Many people think that they have nothing–at least of consequence–to offer. Yet all that we have comes from God. Nothing that comes from God is inconsequential. This is post #1950 of BLOGA THEOLOGICA. World War I (1914-1918) was a devastating conflict which changed the map of the world. Many of the problems of today have much to do with that war and the events of the years immediately following it. Europeans promised the same territory to both Jews and Palestinians, created Iraq (where the British military became bogged down in an insurgency for years), broke up empires, and created new countries, some of which (Czechoslovakia and Yugoslavia) which have ceased to exist. U.S. President Woodrow Wilson (in office 1913-1921) oversold the conflict as a war to make the world safe for democracy. Meanwhile, back home in the United States, which entered the war in 1917, early in Wilson’s second term, which he won on the slogan “He Kept Us Out of War,” xenophobia, nativism, and irrationality reigned. The city of Pittsburgh, Pennsylvania, banned performances of the music of Ludwig von Beethoven, an anti-imperialist who died in 1827. Had the great composer been alive in 1917 and 1918, he would have opposed the policies of Kaiser Wilhelm II. But why let reason stand between one and an irrational fear? Mobs burned books in the German language or about Germany, vandalized buildings belonging to congregations where worship was not in English, dachshunds became liberty hounds, the state of Iowa outlawed public gatherings where the spoken language was not English (although many sheriffs in the state permitted Danish Lutheran congregations to worship in Danish), et cetera. Opposing state-sponsored violence became a crime, one for which many pacifists went to prison and conscientious objectors suffered. Really, were the Amish, Mennonites, and Quakers threats to national security? Were the Dutch Reformed (of the Christian Reformed Church in North America in particular) and the Lutherans (especially those in the denominations we call The Lutheran Church–Missouri Synod and the Wisconsin Evangelical Lutheran Synod these days) worshiping in other tongues that threatening? In November 1918, at the organizing convention of the newly merged United Lutheran Church in America (1918-1962), derived from German immigrant stock in North America since the 1700s, delegates felt the need to demonstrate their patriotism by singing “The Star-Spangled Banner” and “America,” due to lingering suspicions related to Germany, German-Americans, and the war. The study of the past tells me that the war did not live up to its billing, that wartime hysteria and intolerance turned into widespread disillusionment, and that the psychological scars of the “Great War” or the “World War,” as people called it before World War II, influenced national decision-making (often for the worse) leading up to World War II. Accounts of the “Lost Generation” and the false sense of security the Maginot Line engendered testify to the aftershocks of World War I. These and other facts influence how I read certain texts from World War I and the time immediately following it. How can they not, given my temporal relationship to that conflict? During that war and immediately afterward some denominations amended their recent official hymnals. 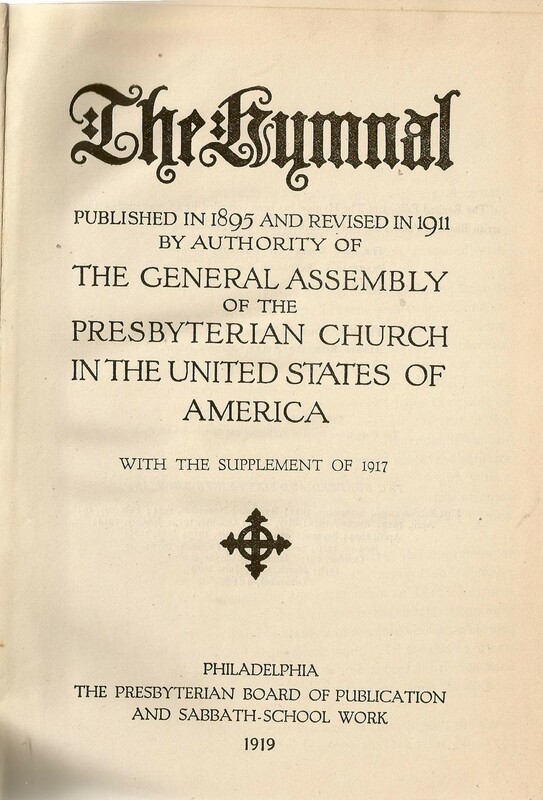 The Presbyterian Church in the U.S.A. added the “Supplement of 1917” to its Hymnal of 1911. This supplement consisted of three patriotic hymns: “God of Our Fathers, Known of Old,” “The Star-Spangled Banner,” and the “Battle Hymn of the Republic.” The National Council of Congregational Churches of the United States added three hymns to The Pilgrim Hymnal (1912) after the war. Hymns #542a-c were, respectively, “O Land of Lands, My Fatherland,” “The Star-Spangled Banner,” and “America, America, The Shouts of War Shall Cease.” “The Battle Hymn of the Republic” was already present. While round the world the lists are joined for liberty and light. Hail, sons of France, old comrades dear! Hail Britons brave and true! Hail Belgian martyrs ringed with flame! Slavs fired with visions new! Italian lovers mailed with light! Dark brothers from Japan! From East to West all lands are kin who live for God and man. We break his scepter, spurn his crown, and nail him in his tomb. To make all nations neighbors and the world one Fatherland! The second text was, as the hymnal labeled it, “A National Hymn of Victory Inscribed to the Builders of the ‘League of Nations. '” The author was the Reverend Allen Eastman Cross (December 30, 1864-April 23, 1942), a Congregationalist minister from Manchester, New Hampshire. To soaring spires of song! To God, the only King! Ring out the glad refrain! That have not died in vain! To mock the optimism and idealism of the texts is easy to do, but I propose that to do so is in error. No, these hymns did not predict the future accurately. Yes, the brutality of history since World War I has belied these texts’ highest sentiments, but the dream those hymns represent has never ceased to be a noble one. The texts are of their time in two senses: certain references to nations and the level of optimism regarding the future. Without a goal to which to aspire, however, how are we humans supposed to improve the world? I value precision in language, so I mark the difference between the Social Gospel and Neo-Orthodoxy. The former is more optimistic regarding human potential for effecting goodness than is the latter. Neo-Orthodoxy, with its sober understanding of human nature, incorporates the best of the Social Gospel and emphasizes the human obligation to reform society and its structures for the better while stating that only God can usher in the Kingdom of God. I read these quoted hymns through my lens of Neo-Orthodoxy and recognize a combination of naiveté and realism as I mourn the fact of those dashed hopes. May nobody permit pessimism to prevent one from doing what one can to leave the world (or one’s corner of it) better than one found it. God can save the world, but we can improve it. We can love our neighbors as we love ourselves and seek to reform unjust social systems and institutions. We have a moral imperative to do so. Bachmann, E. Theodore, with Mercia Brenne Bachmann. The United Lutheran Church in America, 1918-1962. Edited by Paul Rorem. Minneapolis, MN: Fortress Press, 1997. Holy Women, Holy Men: Celebrating the Saints. New York: Church Publishing, 2010. Mortenen, Enok. The Danish Lutheran Church in America: The History and Heritage of the American Evangelical Lutheran Church. Philadelphia, PA: Board of Publication, Lutheran Church in America, 1967. 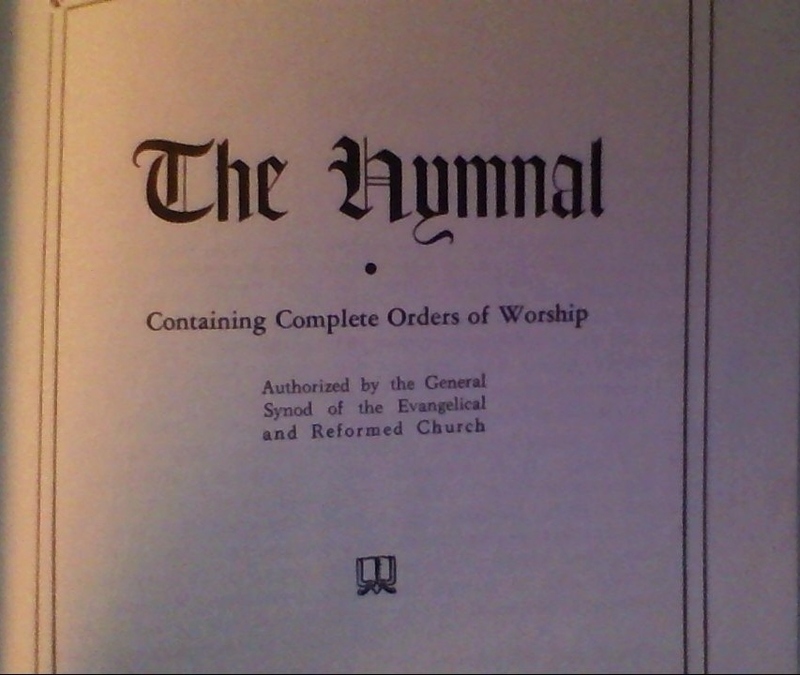 The Hymnal Published in 1895 and Revised in 1911 by Authority of the General Assembly of the Presbyterian Church in the United States of America; with the Supplement of 1917. Philadelphia, PA: The Presbyterian Board of Publication and Sabbath-School Work. The Pilgrim Hymnal with Responsive Readings and Other Aids to Worship. Boston, MA: The Pilgrim Press, 1912. Amended and reprinted, 1919.
and in him we inherit the riches of your grace. This is a devotion for the day after Christ the King Sunday. Pope Pius XI created that festival in 1925, when dictators governed much of Europe, interwar tensions were rising, and the Holy Father perceived the need to issue a reminder that God is in control, despite appearances. The original date was the last Sunday in October, opposite Reformation Sunday in many Protestant churches, but the Roman Catholic Church moved the date to the Sunday before Advent in 1969. In the middle of the twentieth century many U.S. Protestants observed Christ the King Sunday on the last Sunday in August. I have found evidence of this in the official materials of the reunited Methodist Church (1939-1968). Today observance of Christ the King Sunday (on the Sunday before Advent) has become common in many non-Roman Catholic communions. I have detected it in the Revised Common Lectionary and the Common Lectionary before that, as well as in official materials of Anglican/Episcopal, Methodist, Moravian, Presbyterian, Lutheran, Disciples of Christ, United Church of Christ, Cooperative Baptist, Evangelical Covenant, and other denominations. In contrast to Christ the King we have the fictional Ahasuerus, a pompous figure whose courtiers manipulate him. He and others figure in the Book of Esther, which the germane notes in The Jewish Study Bible (2004) refer to as a low comedy with burlesque elements, as well as a serious side. (Comedy has a serious side much of the time.) The Book of Esther pokes fun at authority figures, one of the oldest pastimes. 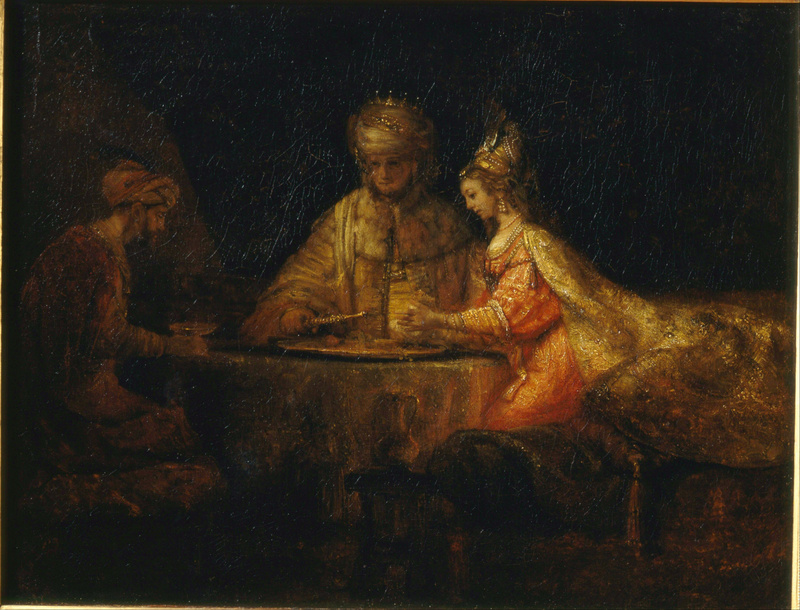 Ahasuerus, humiliated when Queen Vashti refuses his summons, decides angrily to replace her. Before he can reverse that decision, his advisers intervene. This opens the narrative door for Esther to become the secretly Jewish Queen of Persia just in time for Haman to plot to kill the Jews. Esther might have been a tool of schemers initially, but she becomes an instrument of God. Regardless of the situations of our daily life and how they became our reality, may we obey God and do the right thing. This might prove to be quite dangerous, leading even to death, but so did the path of Jesus, our Lord and Savior. I like old hymnals. In fact, I find them infinitely more interesting than contemporary ones. Please do not misunderstand me, O reader; I am not a reactionary with regard to hymnody. I do not assume that there has not been a good hymn or hymnal to come down the pike since an arbitrary year. I am unlike a certain man who told me years ago that nobody had written good church music after 1900. Rather, I am like the archaeologist of a joke I heard once; the older his wife became, the more interesting he found her. In this case, the principle applies to hymnals. Christianity is constantly finding better forms of religious expression. Symbolism, architecture, and ritual are leading the way to finer sanctuaries and more impressive worship services. A positive theology is asserting itself anew and is greatly influencing religious thinking, thus paving the way for a revival of spiritual living. Religious realism claims a place in the program of the Church and in the life of believers as a means of interpreting satisfactorily for modern man the social phenomena of an awakened world conscience. Out of all this grows a demand for greater unity and strength, and greater dignity and depth in worship, the influence of which becomes apparent in the hymns we sing. THE HYMNAL takes cognizance of this demand. THE ATTACK OF THE 1970S. I am the A and the Z…. The infiltration of shallow church music continues, unfortunately. Lift Up Your Hearts (2013), the new hymnal of the Reformed Church in America and the Christian Reformed Church, is more about the heart than the head and leans toward contemporary music. Glory to God: The Presbyterian Hymnal (2013), of the Presbyterian Church (U.S.A.), contains some praise music, but at least the book leans toward a traditional hymnody. The United Methodist Hymnal (1989) is of a decidedly Low Church mold, unlike its immediate predecessor, The Methodist Hymnal/The Book of Hymns (1966), which tried to raise the bar, only to become unpopular in many corners of the denomination. The 1989 book does, unfortunately, contain “seven-eleven” songs, with about seven words one sings eleven times, as the saying goes. And, ironically, the official Baptist Hymnal (2008), of the Southern Baptist Convention, contains a less traditional hymnody, including more praise music, than the Celebrating Grace Hymnal (2010), of the Cooperative Baptists. And I have yet to analyze certain contemporary non-denominational hymnals, which I have seen yet not studied for hours on end. What I have seen, however, has troubled me, given the emphasis upon the informal, the repetitive, and the contemporary. I have been reading so much about so many hymnals recently that I have forgotten where I read certain comments. 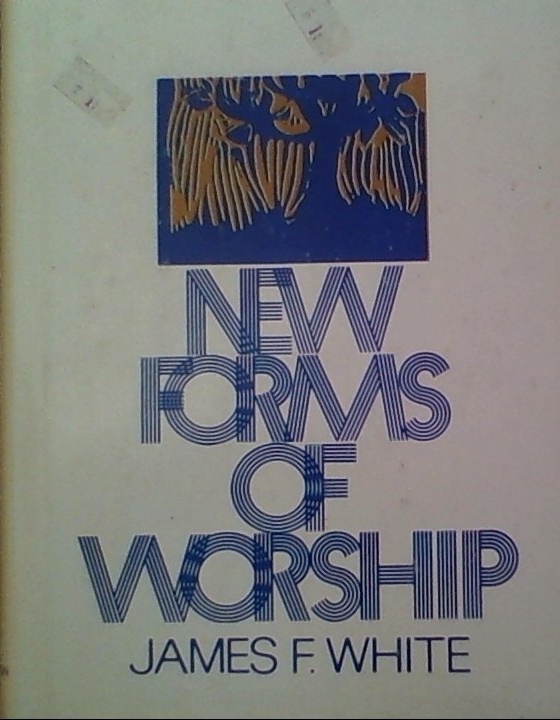 In one of these online places I read a cogent analysis of many contemporary hymnals: they are more about the worshipers than the one whom the people worship. I appreciate worship done well. It elevates the human spirit. It ought never to become entertainment. Worship done well creates an atmosphere all about God and differs stylistically from the rest of one’s life, unless one lives in a cloister or a similar setting. Churches should look like churches. Hymn texts should be profound and wordy. Worship should be dignified. And Eucharist should be the frequent and central act of Christian worship. Here I stand; I will do no other.